As parents, we all know at least a little about the kid tracking apps on the market these days. Even if your children (like mine) are too young to use them just yet, it is likely that you have come across them in the app store or in the news. As it turns out, even though it is for their own good, older children aren’t huge fans of knowing that their parents are tracking their movement, online activity, and phone calls. Now, Alert.Us has released a child-tracking app that they claim kids will not only like, but grow to accept and recommend. 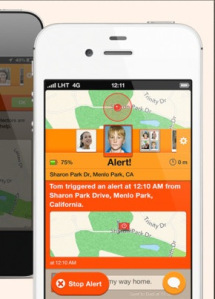 The app currently offers the normal features that we usually see in a child-tracking app, such as a geo-fenced alerting system, and an emergency alert button that, when pressed, can notify a pre-set list of contacts with a message. Alert.Us also touts a few features that haven’t been tried before in an app such as this. Alert.Us goes beyond the simplistic alert features and becomes a full blown ‘family app’ by integrating features like a message board that allows family members to leave short notes for one another (“Remember to walk the dogs when you get home!”). Another different, yet genius, feature that is included with the Alert.Us app is the ‘Battery Life’ feature. This gives parents the ability to receive an alert when their child’s phone battery begins to get low. This is a great feature that will avoid that mini-heart attack that all parents experience when their child doesn’t immediately answer their phone. It’s also a great way to intercept the ever popular “Sorry Mom, my battery was dead” falsehood. Parent’s can take advantage of this service by downloading the app and paying a $6.99 per month service fee. If you are unsure whether or not your family would benefit from this kind of service, Alert.Us is also offering a free trial that allows parents to use the service for free for 900 minutes or three alerts, whichever comes first.